Asta Skin and Body Care is located in Beverly Hills, California. We offer a huge variety of facials, body treatments and waxing. Facials are custom designed and range from problem correction to skin rejuvenating using the latest technology such as Diamond Microdermabrasion, LED, Micro Current, Ultrasonic, RF. Unique Amber Face and Body Treatments that bolster the immune system helping to compensate for energy drain in the body and brain. Asta is focused on providing skin care services with the highest levels of customer satisfaction to meet her clients expectations. The treatments are result oriented and optimized and further supported by professional skin care products that are created for Asta Skin and Body Care using traditional natural as well as the highest quality newly discovered ingredients. Experience Asta’s Unique Quality at Excellent Prices! METERED PARKING is available in front of the building on Beverly Drive. 24 hour advance notice is required when cancelling an appointment. All first time clients have to be secured by credit card. If you need to cancel your appointment in less than 4 hours prior the appointment time you will be charged 50% price of cancelled or “no show” appointment by secured credit card. 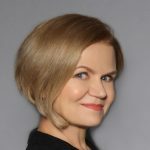 Dynamic, compassionate, licensed esthetician , member of Associated Skin Care Professionals , in beauty and wellness field since early 1990’s, Asta believes in natural healing and harmony with oneself. By combining years of practice and research with groundbreaking science she has developed exclusive, effective and efficient skin care solutions for her clients. Her goal is to help re-balance and restore the skin to a normal condition and ensure that it is looking healthy, beautiful and vibrant. After years of working in beauty industry Asta continues to invest in her knowledge and education.